NEW ORLEANS–(BUSINESS WIRE)–Founded in 2001, the Urban Conservancy is a New Orleans-based nonprofit organization dedicated to research, education and advocacy that promote best practices in developing New Orleans’ economy and community. With the goal of fostering economic resiliency and continuity in New Orleans, the organization educates local would-be entrepreneurs about starting and expanding a business. A $6,000 Partnership Grant Program (PGP) award from IBERIABANK and the Federal Home Loan Bank of Dallas (FHLB Dallas) will help Urban Conservancy in its effort to further its program. 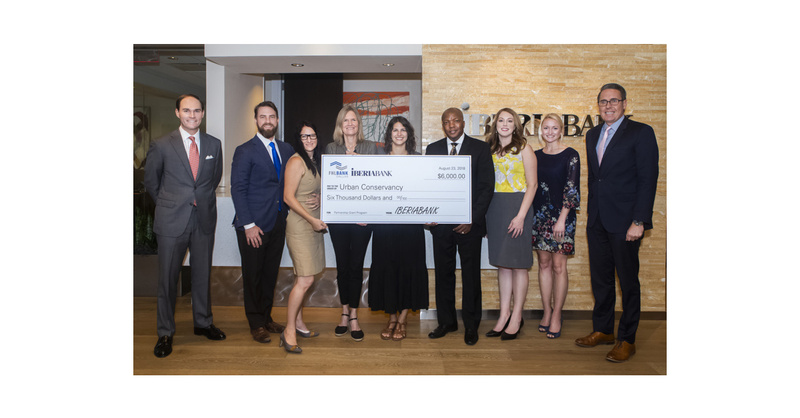 Bank and project representatives yesterday joined local elected officials in announcing the funds at a check presentation at IBERIABANK’s offices in New Orleans. The grant will fund all aspects of producing the ReadyBIZ tool, an educational resource for entrepreneurs and small business owners, which will include four educational videos and a visual roadmap on how to begin and maintain a successful business in New Orleans. This is the organization’s fourth PGP award from IBERIABANK and FHLB Dallas. FHLB Dallas’ PGP awards provide 3:1 matches of member contributions to provide grants up to $12,000 that help promote and strengthen relationships between community-based organizations and FHLB Dallas members. The PGP also complements the development activities fostered by FHLB Dallas’ Affordable Housing and Community Investment programs. Including grants in 2012, 2014 and 2016, the Urban Conservancy has been awarded a total of $22,500 in PGP funding through IBERIABANK and FHLB Dallas. “IBERIABANK invests in local nonprofits that directly benefit the communities in which we serve. Urban Conservancy is a great example of one of these partnerships in New Orleans. They are a client, neighbor and nonprofit partner, and we are proud of the Urban Conservancy’s efforts to improve our city,” said Hunter Hill, New Orleans market president for IBERIABANK. IBERIABANK Corporation, a Louisiana corporation, is a financial holding company with 333 combined locations, including 213 bank brand offices and 1 loan production office in Louisiana, Arkansas, Tennessee, Alabama, Texas, Florida, Georgia, South Carolina, New York, and North Carolina, 29 title insurance offices in Arkansas, Tennessee, and Louisiana, and mortgage representatives in 72 locations in 12 states. The Company also has 17 wealth management locations in 4 states and one IBERIA Capital Partners L.L.C. office in Louisiana.